On July 1, 1897, Edward Shue was convicted of murdering his wife Zona “Elva” Heaster Shue–thanks to HER testimony. Elva’s husband Edward had gone to work that morning and sent a boy home at lunchtime to see if Elva needed anything. The boy returned with the awful news that his wife was dead. Edward rushed home, moved the body to the bed, and dressed it in a high-collared dress. This was unusual in those days when the women of the community would have washed and dressed the body before laying it out for viewing. When the doctor arrived, Edward was so hysterical, the doctor barely had a chance to examine the body. He declared that Elva had died of natural causes and left. Elva was buried soon after and that was the end of the story. Elva’s mother Mary Jane Heaster somehow felt Edward was responsible for her daughter’s death. She claimed that when she washed a white sheet she had taken from inside the coffin, the water turned red. About a month later, Mary Jane said that her daughter’s ghost appeared to her claiming that Edward broke her neck because she hadn’t prepared any meat for dinner. After three nights of this, Mary Jane went to the local prosecutor and insisted they dig up Elva’s body and reexamine it. He refused until the doctor confessed that he really hadn’t done a proper autopsy. On February 22 the body was exhumed over Edward’s protests and it was easily determined that Elva’s neck had, indeed, been broken. Edward was charged with murder. Mary Jane served as a key witness, testifying to the visitations from her daughter. The defense tried to make her look crazy, but Edward was convicted and died three years later in jail, still proclaiming his innocence. 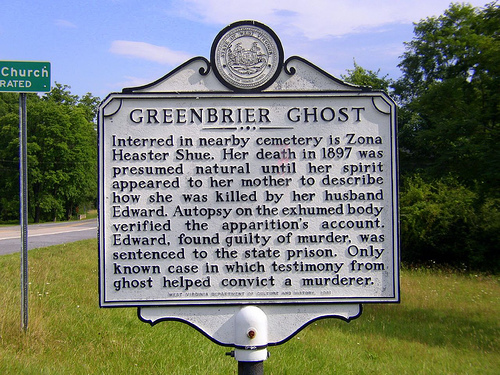 The Greenbrier Ghost hasn’t been seen since. And people wonder where I get ideas for stories . . .